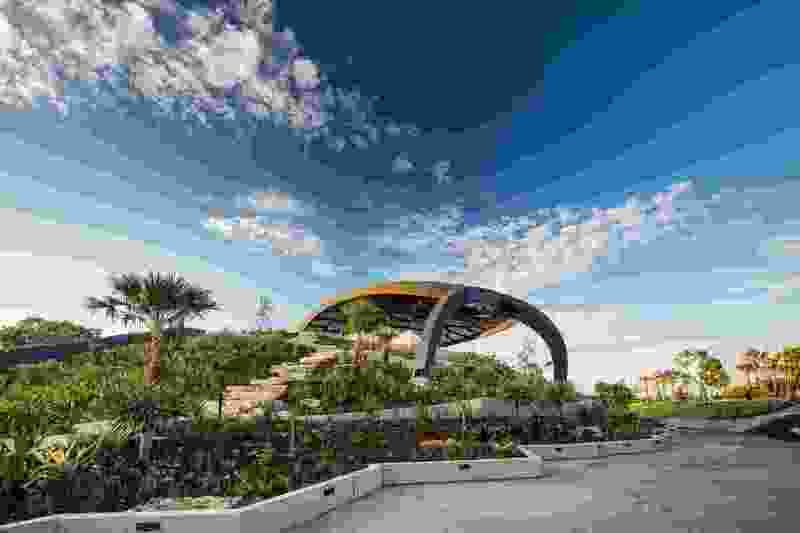 The core of the Home of the Arts (HOTA) stage and theatre spaces reside beneath a “mountain” landscape made up of succulents, rainforest species and grasses from the wider Gold Coast region. In February 2018, the Arts Centre Gold Coast became Home of the Arts (HOTA), launching an ambitious program for its recently completed amphitheatre project, the Versatile Outdoor Space (VOS). 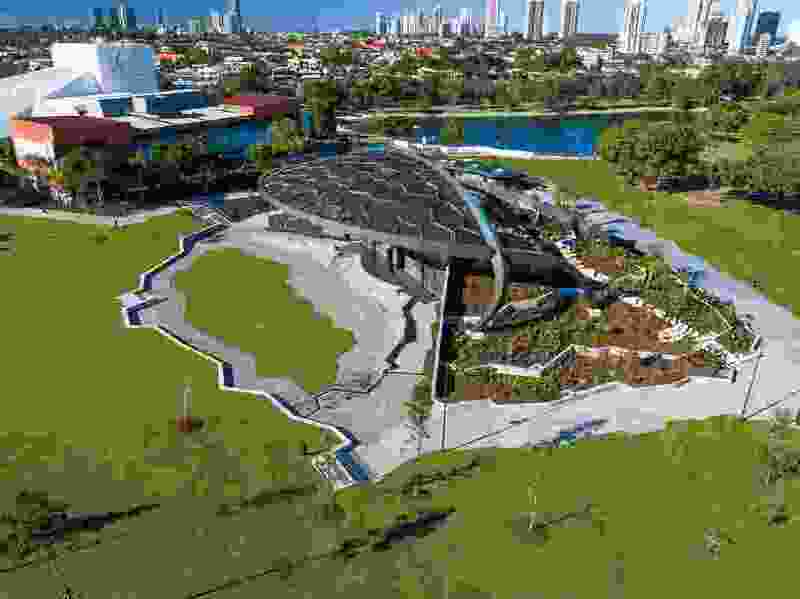 As the first phase of the Gold Coast Cultural Precinct masterplan led by ARM Architecture and Berlin-based Topotek 1, this outdoor stage underscores the landscape-led ambitions for the redevelopment of the larger Evandale site. 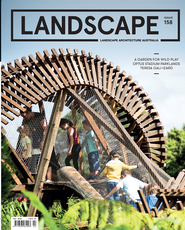 Working with Brisbane-based landscape practice CUSP, ARM and Topotek 1 have designed a highly adaptable and multi-layered set of spaces that seeks to draw visitors to the precinct for both scheduled events and informal gatherings. Evandale Park is a 17-hectare pocket of parkland that tucks into the Nerang River on the southern side of Chevron Island. Until the completion of the proposed green bridge, planned for 2019, the site remains accessible only from Bundall Road along its western edge. For now, this makes for a beautifully drawn-out reveal of the Surfers Paradise skyline that provides the backdrop for views at the river’s edge – but we’ll return to this in a moment. 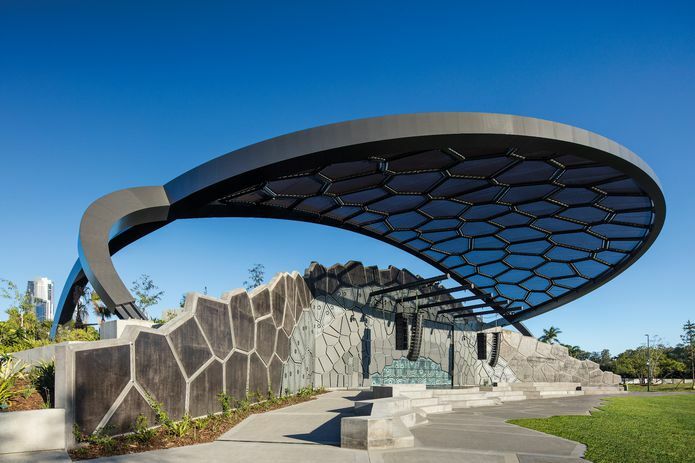 Approaching the stage and concert lawn from the current gallery and performing arts centre, Voronoi patterns – a signature ARM design element – dominate the VOS and its surrounding hard landscaping elements. This cell-like tessellation is featured throughout the stage’s external and internal surfaces, as well as in the fabric canopy above. As a conceptual strategy, the use of Voronoi patterns was a central component of the 2013 competition-wining precinct concept designed by ARM and Topotek 1. The flattened geometry of the amphitheatre and its angular concrete steps are shaded by the distinctive fabric canopy above. Catching a first glimpse of the project’s carefully crafted concrete steps and flattened geometric forms from the concert lawn, I must admit to feeling somewhat relieved to find no trace of the literal “splash” of water in suspended animation that had defined the stage’s penultimate form. The realized VOS retains something of the playfulness of that earlier iteration, but it also demands to be taken much more seriously as a live performance venue and as an element within the landscape. 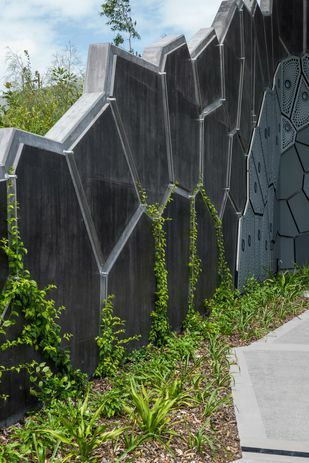 At a conceptual level, the decision to deploy the Voronoi cells throughout concrete pathways and along the main stage walls allows the pattern to be read much more convincingly as a form of growth emerging from the site. Rather than succumbing to the Voronoi’s viral-like properties, or registering as a forceful overlay to the existing landscape, the resultant structure appears more as an outcrop. In this respect, the project also does a remarkable job of concealing (or at least downplaying) the significant pieces of infrastructure and technology that allow it to host performances for an audience of up to five thousand, a black box theatre and fully equipped function room while these spaces are not in use. During these times, the concert lawn and the river elevation of the outdoor stage are allowed to claim the spotlight as welcoming – perhaps even surprising – spaces to sit, walk or explore. The tessellating structure of the Voronoi pattern that defines the stage’s surfaces extends outward into the broader landscape. The lawn is already inviting as a potential picnic spot as the weather begins to cool. A selection of cabbage tree palms, Queensland kauri pines and jacarandas planted around its perimeter appear well-positioned to provide some more protected areas on site as they mature. In addition to the jacarandas, colour is also provided by the pink bougainvillea already creeping along the outer edges of the stage wall. Behind this wall, and precisely where one might expect the stage to completely give way to back-of-house functions, the project reveals itself as a building and landscape in the round. As more sweeping views of the towers of Surfers Paradise come into view toward the river, it also becomes clear that the core of the stage and theatre spaces have been buried underneath a landscape comprised of floristic vignettes from the broader Gold Coast region. To minimize weight on the dome structure, geofoam packing was used to replace soil where only shallow soil depths were needed. This careful selection of local flora – another aspect of the project that capitalizes on the collaboration between ARM, Topotek 1 and CUSP – has been designed to be experienced not just from surrounding spaces, but also as a mountain trail. Its northern and southern edges offer entry points via natural stone steps and paving (unfortunately, the grade here makes a fully accessible path impossible). While small pockets of seating have been created along the short climb, the best views are, of course, reserved for the top of the trail at the centre of the project. Vines scale the walls of the stage structure, using the outline of the Voronoi pattern as a frame. 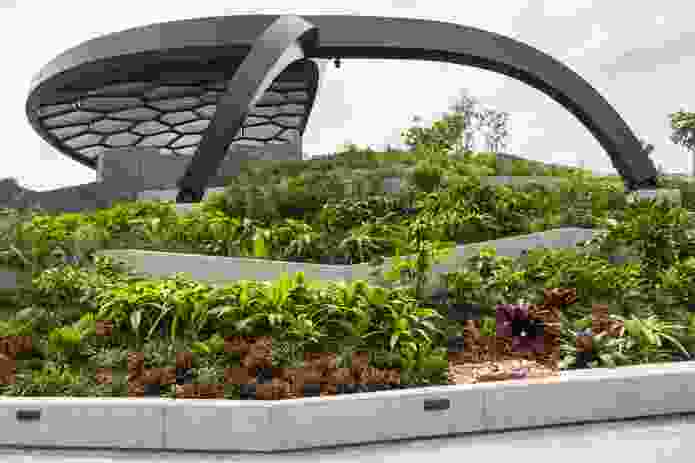 The terrain moves from more formalized planting and welcome gardens at its base (succulents to the north, coastal rainforest species to the south), through to a summit garden of mountain heath grasses and grass trees. The level of planting over the theatre is impressive, and has been achieved with the help of geofoam packing to limit the amount of soil used in areas where shallow planting depth is required. The outdoor stage at HOTA is undoubtedly impactful, reflecting its status as a venue with the capacity to host any number of ambitious productions and live performances. As a larger landscape proposition, though, the project also makes an attempt to operate as a series of adaptable outdoor spaces that consider and facilitate more casual forms of occupation and use. The decision to create a permanent landscape over the main structure is effective as a way of quite literally grounding the forms of the stage walls. While providing much-needed protection to the west-facing stage area, the canopy is perhaps the only element of the design that resolutely challenges the narrative of the Voronoi pattern as a form of organic growth. At the moment, it reads as something added, but I am tempted to wait and see what the establishment of the hillside landscape might add to the connection between canopy and stage in the years to come.